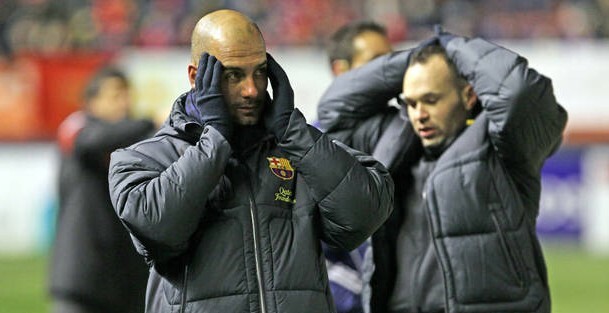 Home / Barcelona / COPA, LIGA, CHAMPIONS – Where do Guardiola’s priorities now lie? When the final whistle blew on a wind battered Reyno de Navarra stadium, FC Barcelona’s collective faces told a thousand stories. But for a miracle, even prior to their crunch tie with Osasuna, the league was already gone. Now, Guardiola will need more than divine intervention if he is to lead Barcelona to their fourth successive league title. As someone put it to me after the game, admitting that such a talented team has finally been beaten feels barbaric, but the logic within any sane-minded follower of La Liga leads to only one conclusion. Real Madrid are unlikely to falter, and if they do, they’re doubly unlikely to falter twice. Even if Levante pull off the shock of the century (to follow the shock of the season in their last encounter) and take points from the men in white, it will do little to shorten the gap between the top two. Certainly not enough to have any real influence on the outcome of the league. Ten points is a horrific gap, seven isn’t much better, and realistically Barcelona were probably beaten before a ball was kicked on Saturday night. For this Barcelona team to have caught Madrid they would have needed an extra inch in their strides at the minimum. Instead, the likes of Gerard Pique look to have lost, not gained, fighting spirit. Along with Pedro, the Barcelona defender put in his poorest display in recent memory for the blaugrana, and certainly wouldn’t have gotten in to the Osasuna team on the night based on his performance. It’s difficult to criticise Pep Guardiola, but in withdrawing Pedro and Puyol for Tello and Cuenca, the Catalan coach made almost the right call, but with one fatal error. Pique, not Puyol should have walked, and history should have taught Pep that when Puyol’s on the park, Barcelona are far less likely to lose. Instead what we got was a Gerard Pique who floundered his way through a horrid 80 or so minutes before finally being saved the embarrassment of finishing the game. Even in a stint as an auxiliary number 9, an area in which he has so often played saviour in the dying minutes of games past, he looked desperately out of sorts. The contrast between the assured Gerard Pique of seasons gone by, a player that would have turned an attacker inside out then played the perfect past, and the clumsy, flailing mess of a man on the pitch at Pamplona was frightening. Both supporters and the Spanish press alike are quick to suggest that matters off the pitch are causing Pique’s dip in form, but to me this seems too convenient and lazy analysis. Rather, I think it’s more likely that having won so much over a sustained period of time at such a young age, Pique is becoming complacent. Complacency is the very thing that Guardiola has worked so hard to avoid in this Barcelona side, but with injuries causing a lack of competition for key places, it is perhaps inevitable. We can spend hours analysing the minutia of individual performances, but ultimately horrid luck with injury combined with a brutal schedule played a key part in drawing an early sentence on Barcelona’s league campaign. Right now, Guardiola has some important choices to make that will reveal his true priorities for his team. The question now on the lips of every culé in the world is this: should Pep admit La Liga defeat and focus on winning the Champions League? The biggest prize in Europe is the one thing that, should Barcelona go on to win, would overwrite any bitter memories of losing La Liga. To do so would require a cunning slight of hand. Guardiola would need to continue to present Barcelona as at least competitive in their domestic competition (otherwise the outcry amongst supporters would be inevitable) whilst at the same time focusing his resources on Europe. The positives would be there for all to see, should Barcelona came home with the biggest prize of all despite losing domestically. The Catalans would become the only team to defend the title succesfully in its current incarnation. If it were to happen, to me there is no debate over what people would remember this Barça side for in the future: losing the league or making history? It’s a dangerous game however. The alternative is that not only do Barcelona face defeat at home, but through bad luck, poor performances or a combination of both, they are knocked out of Europe. A blow that would be hard on the club at the best of times, it would feel ten times worse should they also be seen to have neglected the league title three months before officially decided. In truth, Guardiola only has one option. Barcelona must continue to fight tooth and nail for a league that is no longer in their hands. At the same time, they must also ensure progression in Europe and, lest we forget, bring as competitive a team as possible to the Copa Del Rey final. Catalans are well known pessimists, and partly as a consequence of this Barcelona are far less effective at chasing a league than their arch rivals. In a press conference last week, Guardiola addressed the issue, and insisted that such a mentality is something he must work to change amongst his team. Pessimism may yet be conquered in the Barça camp, but Catalan pride is something that cannot be subdued, and Pep Guardiola only knows how to do one thing: fight until the bitter end. Rest assured, it’s what Barcelona will do, no matter the outcome. I think you hit the nail on the head with Pique and a few of the other players. It is all to do with complacency which I think is inevitable at some point. After all, the players are only human no matter how good they are. There just isn’t the depth in the squad to challenge the players and keep them on their toes. I would say that the results of Barcelona this season point to this. Madrid may be better than they were this year but I think it is more to do with Barca losing focus against teams they would normally beat. It was always a fear that Barcelona’s undoing would be the lack of squad depth but it has manifested itself in a slightly different manner than many would have thought. Obviously there have been injuries but it isn’t the young kids being thrown into the team due to a shortage of experienced players in the squad that has caused the problem – it’s the lack of experience waiting on the bench that has led to established players such as Pique becoming complacent as you say. Players like Tello, Cuenca, Jonathan and Sergi Roberto are all great prospects for the future, but that is half them problem – they are prospects and still learning their game. I know the Yaya Toure situation was difficult because of the money involved, but he wanted to stay at FCB and would still be there now if the club had wanted him. He was such an under-rated part of the side – the way City have missed him this month bares witness to his influence. The simple fact, for me, is that Real Madrid have a stronger depth of squad and experience – which doesn’t necessarily mean ‘better’ in terms of ability. However, as you say – if Barca become the first team to successfully defend the Champions League then that will be remembered more than relinquishing the league title. Re Iain: I agree, letting Toure go was a mistake, but from what I know he was being pretty greedy and fairly unreasonable. It’s one thing saying you want to say in public and another demanding too much. Madrid aren’t necessarily the better team, like you say. This Barcelona side redefined football, whereas the achievement of this Madrid side is putting together a vast number of stars and getting them to play as a team, something which shouldn’t be ignored but ultimately has already been achieved before (by the same club, no less). I think Pique is significant because at his best he started virtually all of Barcelona’s best attacking moves. Losing him is as damaging as losing Iniesta, and he’s just not at the races unfortunately. Messi is suffering, too, because the team is far too reliant on him. The fact that he wasn’t subbed against Osasuna shows that. He wasn’t having his best game and any other player would be swapped, instead he had to continue to bare the brunt of the pressure and as a result, the loss. Great observations as always guys.